"I feel calmer and more focused..." Read reviews from clients about their results using NeurOptimal®. This method was developed in the 1950s, and the latest technology, the software collects 256 data points per second from your brainwaves and gives real-time feedback to optimize functioning and wellness. Learn how to create resiliency and flexibility with neurofeedback. The system we use in our centers and rentals at Neurofeedback Training Co.. is called NeurOptimal® and developed by Drs Sue and Val Brown at Zengar Institute. Their proprietary neurofeedback system is a highly personalized brain training software. 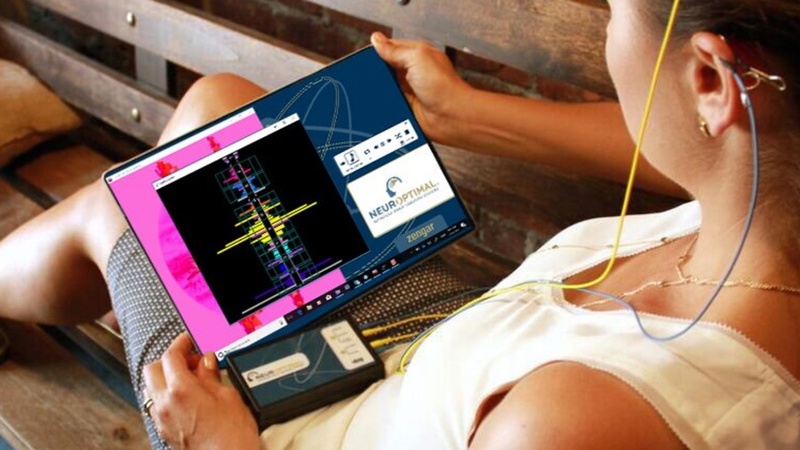 The Dynamic NeurOptimal® Neurofeedback System is a safe and effective neurofeedback training to grow a more flexible and resilient brain. The original conception for NeurOptimal came in the early 1970s at a time when computing speed was not yet as fast as the brain's computing speed. Dr Val Brown, the inventor, had to wait another 30 years before the technology was capable of giving the brain real-time feedback about maladaptive brainwaves. The brain communicates two ways: through chemicals called neurotransmitters and electricity, called brainwaves. The mathematics of NeurOptimal® works precisely with the brainwaves to give you feedback about them. That feedback helps us to become calmer, better able to focus, and help us manage sleep. To help you understand better, here's a real life example of how those maladaptive brainwaves manifest. When we reactively yell at work, we are using the 'fight' response brainwaves. This is part of the stress response which the brain decides reactively to use in moments it perceives as dangerous. This reactive energy is not an efficient use of brain energy when speaking calmly will do the task. We needs feedback to pay attention that here-and-now is not a threatening and that it's about to use a huge amount of energy to solve a simple issue: your employee sent out the wrong information to a client just address calmly. This is the automatic brain that reactively, habitually uses the 'yell response' in communication. NeurOptimal training allows us to register that inefficiency and downshift our energy to be able to see accurate what is the most appropriate and energy efficient response. Read our clients review of their neurofeedback training experience. Clients either trained with in-office sessions or rented a home neurofeedback unit. The Neurofeedback machine for rent is exactly the same as we use in-office and provides the same results. "After 20 sessions, my stress levels have lessened and my focus has been enhanced. Now whenever I am starting to lose my way or feelings of worry and fear, I have another neurofeedback session or two which helps me get back on track. It makes no sense to me but I do experience results!" "I rented a Neurofeedback machine for 3 months and have been very pleased with the results. I feel calmer and more focused. I am very grateful to have had the opportunity. Sara and Kate were wonderful and responsive. Thank you very much!" "I rented the unlimited neurofeedback package. I was immediately impressed with the careful organization of materials and instructions. It is easy for a technological dinosaur like myself to use! The effect on myself is beyond adequate description. Daily increasing peace, focus, more restful sleep and especially less stressful response to the challenges I face"
"I must say, I didn't know what to expect considering that neurofeedback appeared foreign to me. However, after at least a dozen sessions, I felt much clearer, less distracted, and my thought process felt more open to possibility. 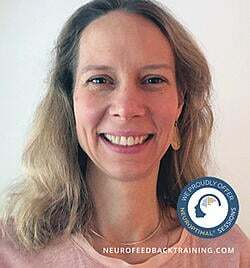 As a practitioner and instructor of body training through yoga, as well as a mental health practitioner, I would liken neurofeedback to be "brain training," which can serve as an integral part of mind-body health. Though I did see results almost immediately, the long term benefits of well being and clearer attention are well worth the investment."